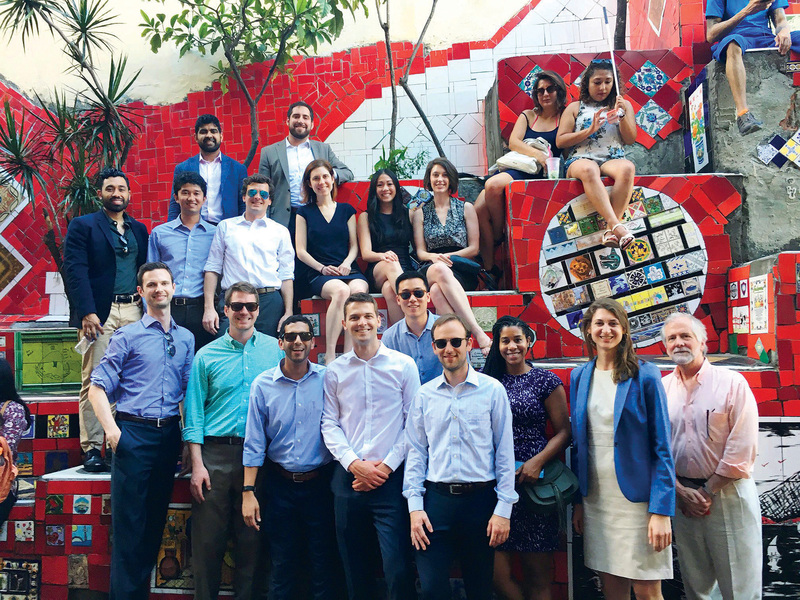 Goizueta full-time MBA students, staff, and faculty lead pose in Brazil. James launched the school’s new strategic plan in 2017, which includes eight focal points crossing the needs of business, students, and scholarly research. While not specifically targeted in the plan, an international approach remains table stakes for successful business practice, and James intends to expand the influence of Goizueta’s strategic plan by exploring global collaborations in each of the eight focal areas. James is deeply aware of the continued influence and impact of global business. Not only do students interact with foreign partners, they are hired by multinational firms. The landscape for international involvement is quite deep. Since becoming dean, James has traveled to Tokyo, Seoul, and Singapore, engaging alumni and meeting some of the school’s international business partners, like Samsung, LG, The Norinchukin Bank, and Daiwa Securities. Emory University has sought to improve its impact abroad as well. In 2015, Philip Wainwright 85C 85G, vice provost for global strategy and initiatives, along with a task force of university representatives, including Goizueta’s L.G. Thomas, released a report on the university’s standing called Global Vision for Emory—a five-year plan to expand Emory’s reputation worldwide as a leader in international scholarship and service. The plan reflects the university’s expanding international connections. In 2002, only 19 percent of scholarly publications at the university had an international coauthor. That number is now more than 33 percent. The number of international students on campus has grown to 20 percent. The task force also focused heavily on the growing realities of business globalization. According to the report, “A modern university is inherently global in reach. In a world of increasing interdependence and diminishing borders, global engagement is no longer a peripheral concern but a necessity.” With James and the university on a similar trajectory, how best to make the MBA international experience more impactful? Indeed this was a question Brian Mitchell 00MBA/MPH, associate dean of the Full-Time MBA Program, was also pondering. Prior to becoming associate dean, Mitchell was a healthcare executive in charge of managing international partnerships. Navigating this rich landscape was often clouded by a lack of cultural awareness by a partner or a member of Mitchell’s team. This experience left an impression, and Mitchell eagerly reviewed the university’s plan on international presence and scope. Then he reached out to Wainwright and discussed the report, seeking ways to incorporate the objectives with the students he oversees. He drafted a proposal, then met with Dean James to rally for support. James was already evaluating the school’s international perspective and commissioned Mitchell to revisit the global strategy, keeping what works and expanding in ways that will keep Goizueta strong on the international stage. With a clear charge and expanded title as associate dean of global strategy & initiatives, Mitchell sought first to leverage the university network in order to bring cultural awareness alive for students. Thus began extensive conversations with professionals across campus, including Wainwright; Michael Elliott, dean of Emory College; and Jeffrey Lesser, a chaired professor of history and director of the Halle Institute for Global Research and Learning. Lesser is an expert in modern Latin American history, focusing on ethnicity, immigration, and race, especially in Brazil. Brazil is one of five target countries identified in the Emory strategic plan, along with India, South Korea, China, and Ethiopia. Colombia and Brazil are constants in MBA travel. As discussions with Wainwright and Lesser progressed, the structure of how culture and history could be taught to graduate students took shape. A pilot program formed quickly. 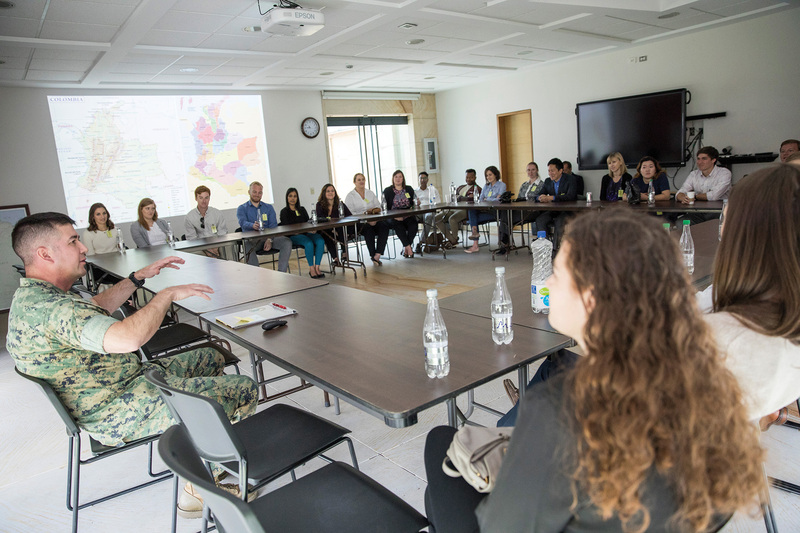 Students visited the US Embassy in Bogotá, Colombia, where they were treated to discussions on culture, economy, and history. Ahead of traveling to Colombia last fall, several one-year students took a pre-departure seminar from Rebbecca Kaplan, associate director of MBA admissions and instructor in the Department of Spanish and Portuguese, where she leads the department’s business Spanish curriculum and teaches on intercultural communication. The six-week course was interactive and upbeat and introduced students to important aspects of Colombian culture via language instruction, with discussions of food, geography, and industry. The pilot extended to cross-campus collaboration with a full-time students’ trip to Brazil in early 2018. Lesser selected two colleagues to craft a six-session pre-travel course: Ana Catarina Teixeira, director of Emory’s Portuguese program with research and teaching interest in postcolonial and cultural studies, and Thomas Rogers, an associate professor of modern Latin American history (with a focus on Brazil). The co-teachers built off their expertise in history and language to offer students a bridge from the classroom to Brazilian culture. For Andrew Kupka 19MBA, the sessions exceeded expectations. Once in São Paulo, Patrick Noonan, professor in the practice of decision & information analysis, led students through the traditional business segment of the trip, including rigorous company visits to firms such as Natura Cosmetics, Brazil’s number one cosmetics manufacturer; Foxconn, a major electronics developer and manufacturer; Bank of Brazil; and Logicalis, a provider of IT solutions and managed services. Pre-travel lectures changed the experience. Gonzalez, formerly of Liberty Mutual, worked with supported Central and South American countries prior to enrolling in the MBA program. He said the trip helped him make sense of the unethical actions he noticed. Emory connections enhanced the cultural experience for students heading to Brazil. 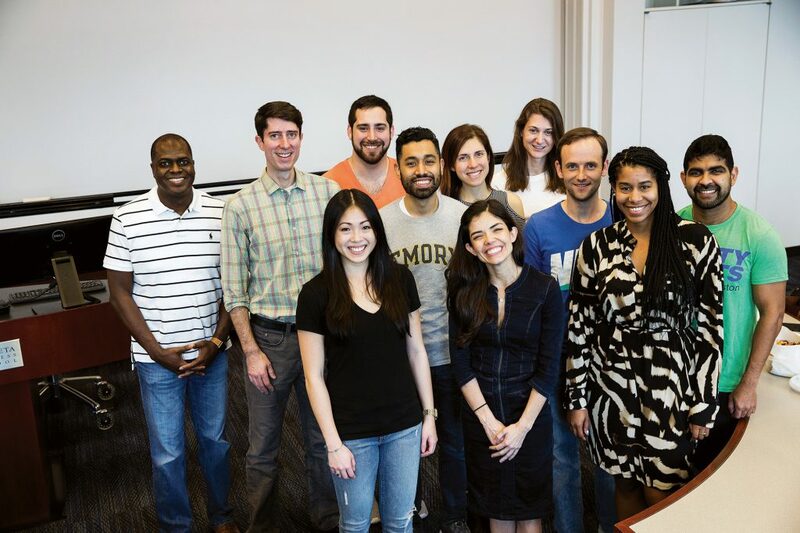 From left, back row: Brian Mitchell, Professor Thomas Rogers, Jacob Novich 19MBA, Arturo Gonzalez Jr. 19MBA, Alexa Fogler 19MBA, Alanna Shuh 19MBA/MPH, Andrew Kupka, and Sundeep Kulkarni 19MBA. Front row from left, Michele Wang 19MBA, Professor Ana Catarina Teixeira, and Goizueta staffer Naya-Joi Martin. As with any pilot program, Mitchell plans a review process to judge effectiveness and scalability. Identifying Emory experts for different parts of the globe will be key. Mitchell also stressed the importance of student experience and marrying such pre-travel work with strategic initiatives. A weightier portion involves building upon the dean’s goals for the school and extending reach to other programs and countries. According to Mitchell, other aspects of the school’s global strategy are expected to emerge in the coming months. Still, other portions will take time to research and implement. Goizueta already partners with more than 100 associations and schools worldwide. The global strategy team, which includes Mitchell, Wainwright, Dean James, and professors such as L.G. Thomas and Jeff Rosensweig, director of the Robson Program for Business, Public Policy, and Government, are seeking to find ways to leverage relationships and find partners. But with business and cultural dynamics constantly changing, flexibility is key.